On this page we will illustrate and describe four Clopay door details and how these doors are constructed and insulated. We have chosen the most popular doors from their three main line categories to illustrate. It helps to be able to see an exploded view or 3D cross-section though the door product so that you have a better understanding of how these doors are manufactured, assembled, and factory finished. The more you know about a product that you will potentially purchase, the better off you will be from the standpoint of understanding value versus cost. During our investigative research into Clopay garage doors product line, we concluded that their design and engineering was excellent because of how they approach all of the problems that overhead garage doors have to face throughout North America and it's varying climate conditions. We think their success is in the details, and we present them below for your consideration. 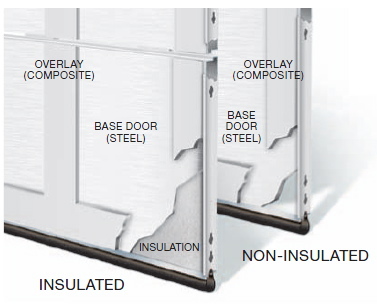 The illustration above shows the cross-section view of both the insulated version of these doors and the non-insulated version. Starting at the bottom of the door you can see a rather large rubber gasket that is necessary on these door types because they are made of steel. If you have variations in your garage floor across the plane of where the door sits, this gasket is what will make all the difference in getting a good tight seal when the door is closed. Because the door is constructed of steel, it cannot be scribed or planed along the bottom edge to match variations in your floor — so the rubber gasket makes it possible to achieve a good fit. The cross-section shows the 24-gauge steel perimeter frame of each panel section and a base-panel of steel for rigidity to keep the door square. The insulated version shows where the insulation goes between the two steel panel sections (interior and exterior). The interior is then finished with a composite overlay (vinyl) that makes for a nice clean interior appearance. The painted portions of the door are factory finished on all edges prior to assembly (if you order a factory finish) or prepped for job site finishing. WindCode rating steel beam sections can be added to the interior of these doors to meet local building code requirements. The illustration at the left shows the construction details for the Clopay garage doors Canyon Ridge Collection. It consists of a five-layer composite of steel+insulation+steel+exterior clading+exterior overlay and is available with 2" polyurethane insulation bearing an R-Value of 19.2. The exterior cladding material is faux wood composed of a 1/2" thick polymer that is molded from actual wood to replicate the species natural texture, look, and feel. The finishes are clear cypress, mahogany, and pecky cypress. 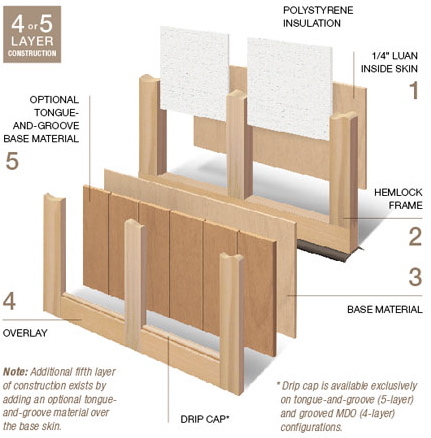 The overlay (frame boards) is constructed of the same materials with the same finish appearance. Once installed, these rustic beauties are virtually indistinguishable from the original, and of low maintenance. There are three available wood-finish tones and prime-painted for job site custom finishing. As can be seen from the illustration above, there has been a lot of design and engineering put into these faux wood doors to give the homeowner a beautiful door of very low maintenance that is extremely energy efficient. If you live in the upper midwest or Canada, and need a insulated garage door because you garage is heated, these will fit the bill and give you that rich-appearance of luxurious warm wood doors. Clopay Garage Doors has truly perfected the faux wood overhead garage door as can be seen in this Clopay door details cross section view. 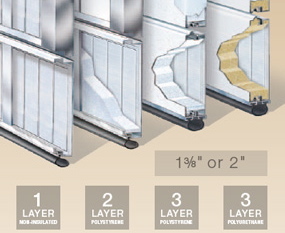 The illustration at the left shows the construction details for the 1-layer, 2-layer, and 3-layer Gallery Collection of Clopay garage doors. They come in 1-3/8" or 2" inch thicknesses depending on what level of insulation you desire. Each cross section features hot-dipped galvanized steel skin with a baked on primer-paint and top-coat that helps ensure maintenance free durability and long-lasting beauty. The homeowner can choose from polystyrene or polyurethane insulation with R-Values ranging from 6.5 to 17.2. The 2-layer and 3-layer doors are insulated and the single layer door is not. Long or short vertical groove steel panels are available in all three-layer versions of these doors. These Clopay door details show the consistent attention to detail and quality that Clopay garage doors have perfected with their unique design and engineering processes. Section joints and bottom gasket weather seal in a corrosion resistant aluminum retainer channel help seal out the elements from the interior of your garage. Windows are standard with double strength clear glass and optional snap-in grilles. Other options include obscure insulated glass that is available on 2" thick 3-layer models with snap-in grilles featuring acrylic wrought iron designs. The Clopay door details illustration above shows an exploded view of the Clopay garage doors from the Custom And Limited Edition Series. Their assembly starts with a solid Hemlock frame that holds the polystyrene insulation, then covered with a 1/4" thick Luan skin that forms the interior of the door surface. Then a composite wood based material is applied to the exterior and over-layed with a (optional) tongue-and-grooved base material that sits beneath the final overlay forming the exterior perimeter framework. The base wood options include construction from tongue-and-grooved Meranti, Redwood, Cedar or Fir, smooth or grooved MDO and smooth Luan woods. Overlay options include Meranti, Redwood, Cedar and Fir woods. These doors, being constructed from solid woods, can be scribed and planed to fit the exact contour of your garage floor profile in the event your floor is uneven along the plane of where the door makes contact. Therefore, they use a somewhat different type of rubber seal along the bottom to protect from the weather elements. This collection of doors can be pre-finished in seven popular stain colors at the factory or prime-painted for custom finishing at your job site. For Clopay door details concerning their entire product line, we encourage your to visit their website at Clopay.